Over the last week or so, I've been stressing out about what to write in my next blog post. I currently have 11 drafts, all half written, which I just don't have the motivation to finish. And then last night, I came to the realisation, quite frankly, I'm being silly. I love writing about real topics and talking to you all about my not-so-secret life as a Disney freak and writing lists for you to all to ensure nobody makes the same life mistakes I do. But, when the pressure to write a blog post gets to the point where I'm stressing out about it this much. It's time to take a chill pill. I will write blog posts continuously, as long as there are minions to read them, I will be here to write them. But I've realised if I do have a heavy week or if I'm just not feeling up to writing an essay blog post, then that's okay too. I get a lot of emails saying how much people enjoy my deeper posts and I promise they will still continue, but my brain needs to slow down sometimes. And the last month of so has been a bit of a mad one (50 hour weeks at work followed by moving to university, oh goodness), and so I'm giving my brain a bit of down time. With that in mind this week is a pretty photo heavy one as I realised I hadn't shared the photo's of my day out with Emma, one of my closest friends. 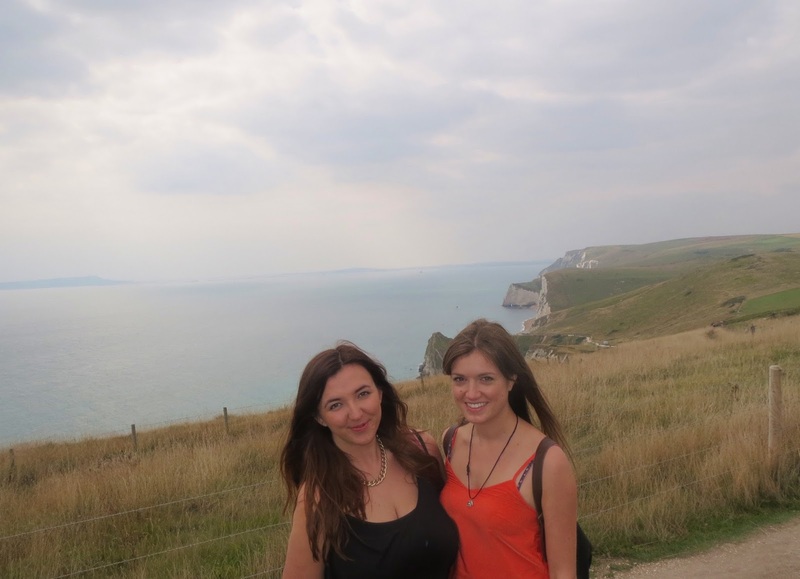 As we were both heading off to uni we decided to take a picnic to one of our local beaches, Lulworth Cove and walk up the giant hill to have a picnic at the top with a sea view. The hill took it out of us to be quite honest, by the top we felt we definitely deserved our delicious picnic featuring strawberries, sandwiches, chocolate and lemonade in plastic wine glasses! Once we'd wined and dined, admiring the beautiful view, we trekked back down the ginormous hill. Walking up may have proved how unfit the two of us are, but walking back down proved even more difficult, we ended up holding each other's hands for support to ensure minimum falling possibility down the steep crumbling slope! Once we'd reached the bottom we walked down the little country lane towards the 'cove', ready to eat the rest of our picnic (we left the best till last- chocolate chip cookies)! Although it wasn't the nicest weather, we had the loveliest day. And returned to the car extremely full and very very content! I hope you've all had lovely weekend's. Please bare in mind the little essay at the beginning of this post if you do chose to send me emails about my content! Take as much time as you need Alice, it's good to take breaks and prioritise - the photos look great! !